I’ve been to a few cooking classes at Hudson Table before. I was impressed every time, so I finally decided that this time I would document the process. For just about every class, you’re welcome to bring your own bottle of wine to drink while cooking. This something that we took full advantage of! If you’re cooking with friends, there should definitely be wine, right? The classes typically hold up to 16 people. 4 tables are set out for 4 groups of 4, and each group is tasked with cooking the entire menu. However, even though this class was Sold Out, the other 2 people in our group didn’t show up! So Courtney and I had to make the entire meal ourselves. I didn’t mind since I actually find it pretty relaxing to be cooking in the kitchen. At the beginning of the class, we all introduced ourselves and played a quick icebreaker. The chef, Gene Monaco, talked about the dishes and prepped us for what we would be doing through the 2 hour course. We also got a quick lesson on knife skills so that we could efficiently cut up the onions, shallots, garlic and apples that we needed for our meal. Once all this was completed, we were told to start cooking! 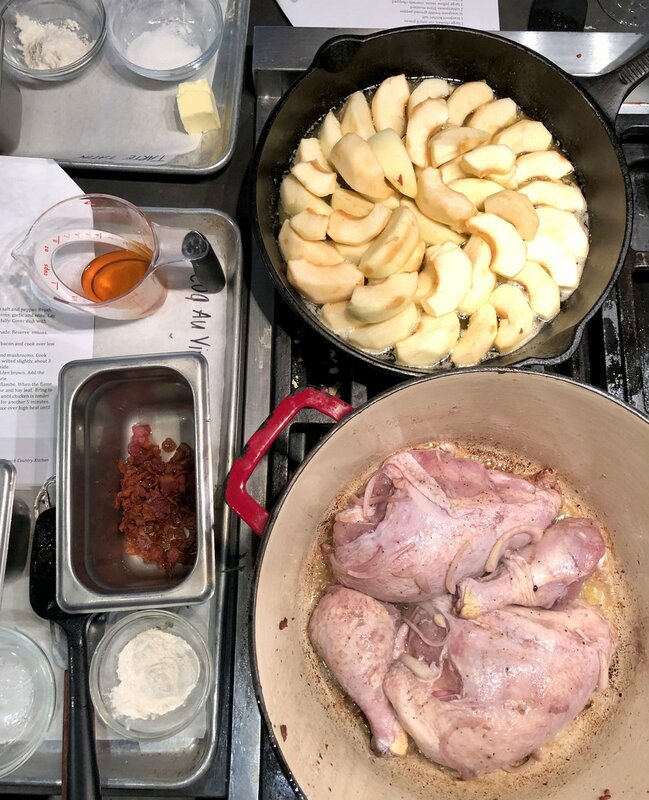 Our first task was to get to work on the Coq au Vin. They had prepped some of the ingredients (thankfully!) and so Courtney focused on starting to render the bacon and braise the chicken. Meanwhile, I started to peel and core the apples for the Tarte Tatin. Eventually I moved over to the stove to start caramelizing the butter and sugar for the dessert. I arranged the apple slices in the pan into circles and then added any remaining apples on top of the first layer. The Tarte Tatin is an upside-down dessert so we want it to look as pretty as possible. Also, check out that chicken below! I will note that we didn’t make the Escargot ourselves, as the Hudson Table staff brought the dish out to us already assembled. They had made the compound butter already and added the snails. The staff put the escargot in the oven and 10-12 minutes later it was ready to eat! They brought around slices of baguette to pair with the appetizer. We were at a natural stopping point as we waited for the chicken and the apples to simmer further, so Courtney and I snacked for a bit. I admit that I’m not a huge fan of escargot, but I did try a bite or two just to make sure I got the full experience. That butter though! Amazing! Once the apples were done, we removed them from the stove, added a layer of puff pastry and moved the pan to the oven for about 30 minutes. I started in on the green beans next. The Hudson Table team had already blanched the beans, so I now added them to a pan with some butter, shallots, and mushrooms. Look! The Coq au Vin is almost done! 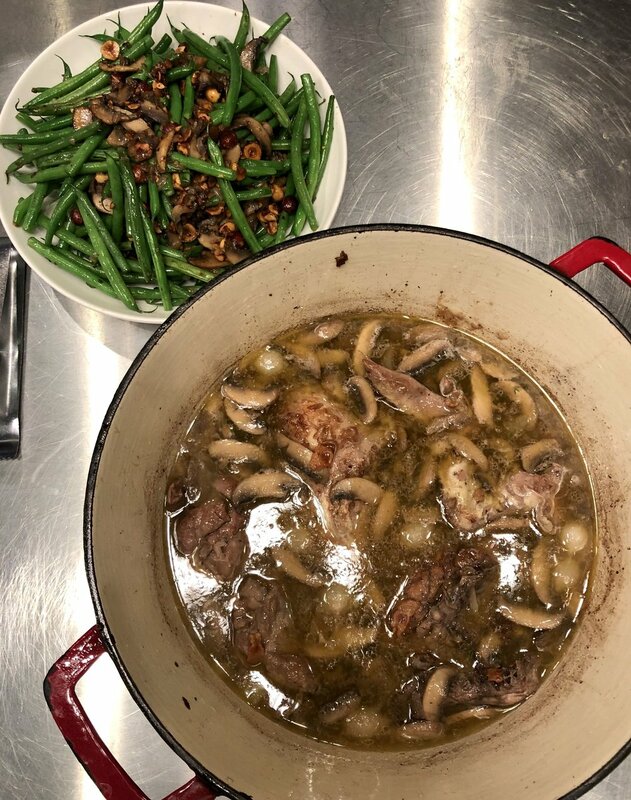 Once all the flavors blended together for the haricot verts dish, we added in the hazelnuts just so they could warm up. We then plated the beans, alongside the Coq au Vin, which we served up simply in the pot. All the teams typically finish their meals around the same time, as we do get help from the Hudson Table staff to make it easier on us. We all sat down with our wine (or waters) and dug in. It was so delicious! I only recall having Coq au Vin once before and that was years ago. I forgot how good it was. I admit that everything we ate was drenched in butter (besides the chicken) but given I don’t really eat such rich food all the time, I was fine with it. And everything tasted so so good! Courtney did an amazing job! Last, but definitely not least, was the Tarte Tatin! I had arranged the apples in a circle so that it looked pretty. However! One of the staff was testing whether or not the apples were tender enough to be put into the oven and he started to stir one section of the apples, so my design is a bit ruined in one area. Please forgive that. At any rate, the taste of the tarte was amazing. If you love caramelized apples and tarts, this is probably something that you will love. I sure did. So, in closing, I think you can tell that I love the Hudson Table. I would really recommend taking a class here, whether you are adept in the kitchen or if you’ve hardly picked up a knife before. 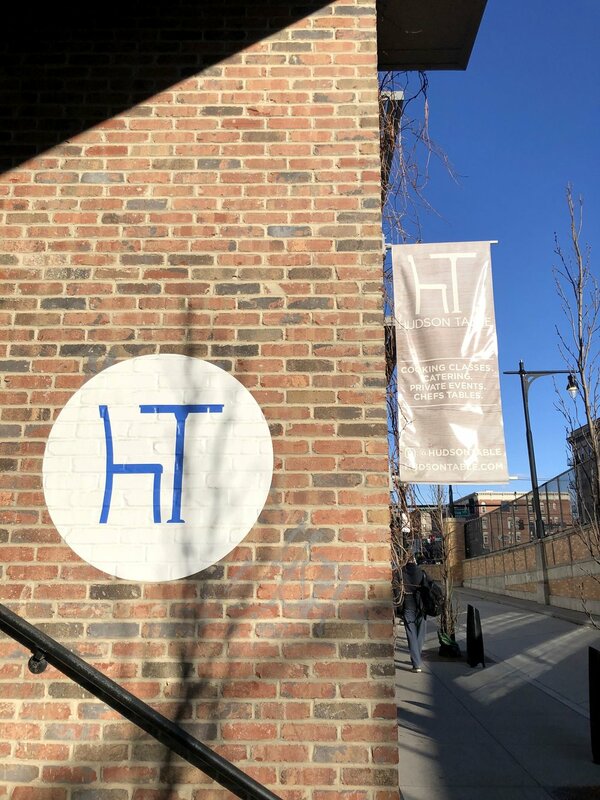 The Hudson Table team will prep everything, walk you through all the steps, and — the best part — they will clean up afterward! They do all this with a smile on their faces and you can tell they really enjoy their jobs. I can’t wait for my next class here. You have to book pretty soon after the monthly class schedule comes out, as many classes sell out within days. If you see something you like, I would suggest to book it right away! If you end up taking a class here, let me know what you think!